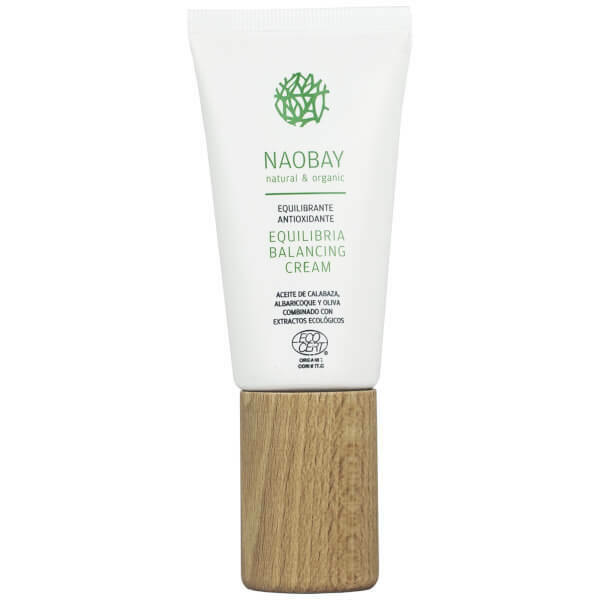 Specifically formulated for combination and normal skin types, NAOBAY's Equilibria Cream works to rebalance, hydrate and nourish your complexion. Utilising a blend of Açaí Extract, Sweet Almond Oil and organically grown Calendula, Aloe Vera and Cinnamon, the fast-absorbing formula contains a high content of Vitamin C to protect from environmental aggressors, whilst reinforcing the skin's hydrolipidic film. Your complexion is clarified, smooth and healthy-looking. Apply to face and massage until fully absorbed. Aqua, Aloe Barbadensis Leaf Juice*, Caprylic/Capric Triglyceride, Propanediol, Polyglyceryl-3 Dicitrate/Stearate, Prunus Amygdalus Dulcis Oil*, Rosa Moschata Oil*, Glyceryl Stearate, Glycerin, Simmondsia Chinesis Seed Oil*, Stearyl Alcohol, Euterpe Olerace*, Calendula Officinalis Flower Extract*, Cinnamomum Zeylanicum Bark Extract*, Dehydroacetic Acid, Benzyl Alcohol, Potassium Sorbate, Acid Citric, Sodium Benzoate, Parfum, Limonene, Linalol, Geraniol. * Ingredients from organic farming.